To kick off my quest for horror credibility, I'm starting with a week of Asian horror. Most of my experience with Asian horror up until this point has been references to their superiority when discussing their American remakes (which I also haven't seen). I put out an ask via Twitter for some suggestions to get me started, and I got a lot of recommendations for the movie that will kick off this series: Battle Royale. 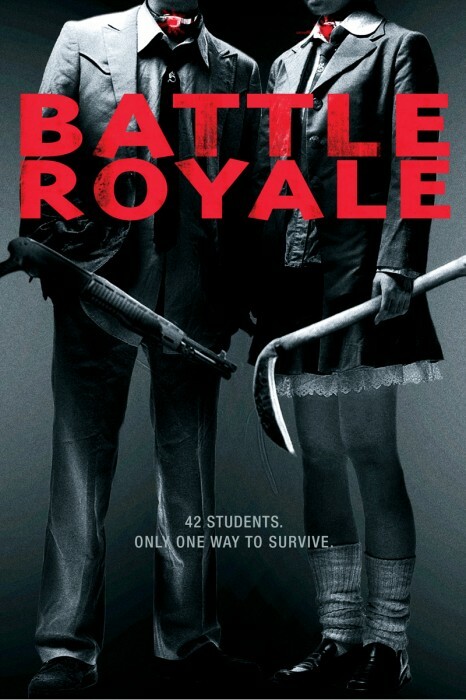 Directed by Japanese filmmaker Kinji Fukasaku and released in 2000, Battle Royale tells the story of class 3-B, a group of unruly students selected by the government to take part in the titular contest, in which they are all trapped on an island and forced to fight to the death. This movie is pretty wild, as rather than hiring a group of "teenagers" who are actually pushing thirty, Fukaskaku cast actual middle-school age children. This choice heightens the impact as they begin killing one another in pretty brutal fashion. At the same time, I don't know if I would call the movie realistic. Everything takes place in a more kinetic fashion. Sure, death in this movie is taken seriously, but it also plays as very over the top, with fast-paced set pieces, dark humor, and digital effects that tone down the realism just enough so that it's not unbearable to watch. It actually reminded me of the slightly tweaked reality depicted in Robert Rodriguez's Once Upon a Time in Mexico. The Faculty of Horror Podcast also points out the interesting choice to have actual children cast in Battle Royale. In fact, if you want in-depth analysis about the sociological context of the movie, I highly recommend taking a listen to the episode. They provide such great insight into the movie that anything I try to add would be redundant. Their discussion about Battle Royale's comparison to the Hunger Games, however, struck me as particularly interesting. They note that the claims of Hunger Games ripping off Battle Royale aren't accurate given the different approaches the films take, and I agree with this assessment. The Hunger Games is an indictment of culture and media, positing that our lust for diversion allows for such a despicable form of entertainment. Battle Royale's scope, however, seems much smaller. The larger ramifications are hinted at, but mostly the movie explores the politics of adolescent relationships, imagining how those politics could play out under such extreme situations. What makes this so interesting to me is that provides for many small stories to play out during the movie. While Shuya Nanahara and Noriko Nakagawa are the main protagonists, virtually everyone in the movie has at least a small piece of significance to add to the plot. We get to just enough time with people and get just enough backstory to care when they die, which I think is a pretty tough feat for a class of forty plus people. Battle Royale was definitely a worthwhile watch, and I'm glad that so many people recommended it. Next up, I'll be watching something that I assume is a little bit more measured in its pace, with 2002's Ju-On: The Grudge.